[HDR-IMG]Oshizushi is a type of sushi that uses a small wooden box to press the sushi into little rectangles. It’s a lot of fun to press the sushi, especially since there are so many different combinations you can make (As you will see, we went a little overboard 😉 ). When you get your box, you will see there are three pieces that make up the box. There should be one box-like piece with vertical slits on the side, and two flatter pieces with wooden feet. One of these flat pieces should have feet that extend beyond the edges of the flat piece of wood. Place this on your workspace, flat side up. Place the box on top of this flat piece, with the vertical slits opening upwards. Place a large piece of plastic wrap in this, pressing it to the bottom and sides so the entire inside surface is covered. The plastic wrap should extend an inch or two over the edges of the box. 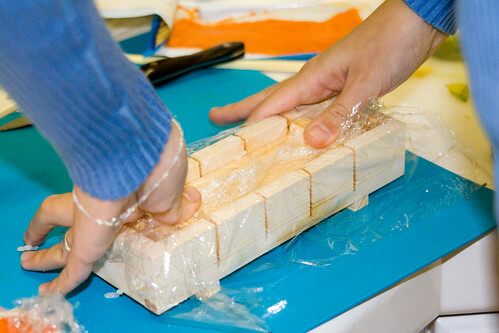 Wrap the second flat piece of wood in plastic wrap. This will keep it from getting too dirty. 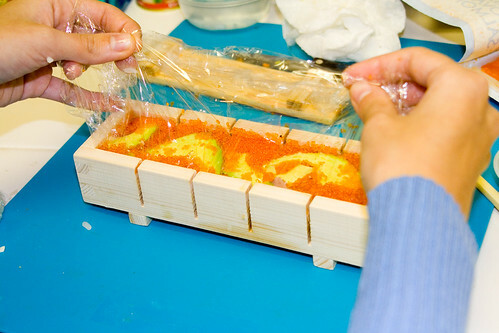 Fill the plastic wrap-covered box about 2/3 full with sumeshi. 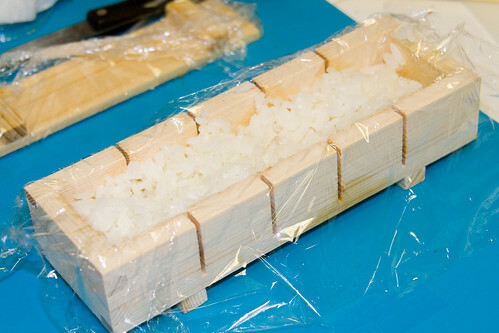 Press the plastic wrap-covered flat piece of wood flat side down in the box to compress the rice. Place your ingredients, one layer at a time, into the box. Compress with the piece of wood between each layer. If you are small and/or not one with much arm strength (like me! ), it helps to have someone heavier or stronger (or both) to help compress it for you. If not its fine, it’s just that when it’s compressed more it sticks together better when you are eating it. I used Son for all my sushi pressing! 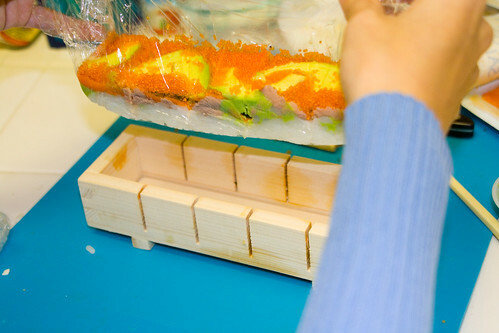 Once all of your ingredients have been placed on the sushi and compressed, use a sharp knife to cut the sushi through each of the vertical slits in the box. Also cut through the plastic wrap. 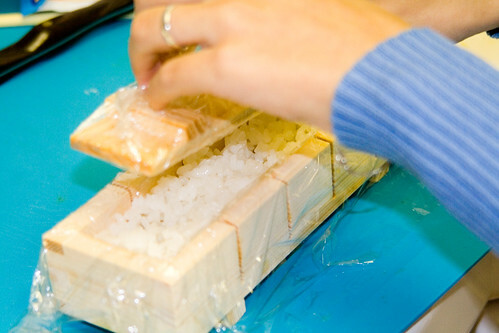 Using the plastic wrap that you had put in the box, lift out the sushi. I prefer to do it this way, just because it keeps the box from getting too dirty. Replace the plastic wrap in the box with a new sheet before you make another batch. Eat your freshly pressed oshizushi! haha oh man I got one of those boxes in one of my kits. I had no idea what it was for. Thanks for showing me what it’s used for. Although mine doesn’t have vertical slits to cut through. Awesome! Great tutorial and looks delicious. I can’t wait to pick up an Oshizushi box at our local Uwajimaya! I’m not sure I’ve seen this at any sushi restaurants myself, do you think this box is tradition to japan? Lara – Fantastic idea! Absolute genius… I would have never thought of that! 😀 Yeah you can definitely use nori in them, it works well as an in-between layer. 🙂 Have fun! hi, can you please tell me where to get a box like the one in the pictures? Because I can only find ones that don’t have the slits on the side for you to cut? I live in London and is there an online website I can buy this from? Thanks a lot! Tiffany – Here is a plastic sushi press from Amazon.com . Hope this helps! 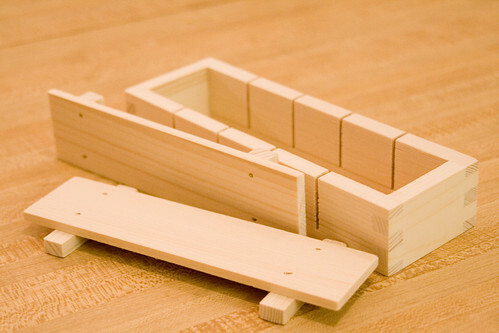 Typically the box is referred to as a sushi press or a sushi mold, although sushi mold can also refer to other things, such as the mold used for the rice in nigiri sushi. The inside dimensions of the box are 7 inches long by 1 3/4 inches wide by 1 3/8 inches tall, and the slits are about every 1 5/16 inches along the long side of the box, 1 1/8 inches long and 1/16 inch wide. The piece of wood that goes on the bottom fits just inside of the box, with legs that protrude out to the side so that it sits just at the bottom of the box. The piece on the bottom protrudes into the box about 3/16 of an inch. Theres also a piece that you use to press the ingredients down with. 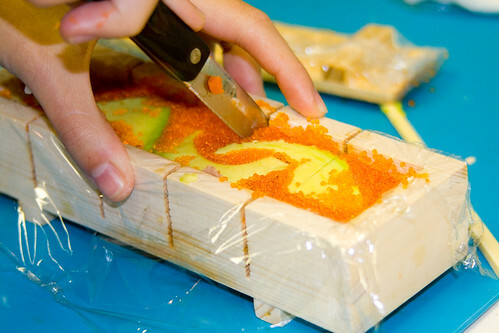 It fits completely in the box, and has a couple of pieces on the top that are of the same width so that you can easily remove the top piece when you are done squishing the oshizushi. I realize that was probably pretty confusing, but I hope that helps! Feel free to ask if you have any other questions! Re #6: Oshizushi or hako-zushi was how sushi is a very traditional type of sushi that was developed around the same time as maki-zushi in the 19th century. It is still popular in the Kansai region around Osaka and Kyoto. Re #11: Elssha, 99 Ranch is a Chinese owned grocery chain that specializes in Chinese and pan-asian ingredients. In my experience, they have some Japanese stuff but not much and sometimes what they do have is low quality. I would go to an authentic Japanese market or house wares store or order a box online. very practical and quite cheaper sushi to make. Nori seaweed wrap is quite expensive especially in the Philippines. 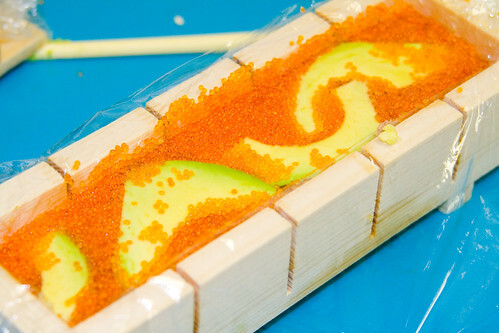 Your method is both economical and allows you to make use of ones imagination in making compressed sushi. very practical and quite cheaper sushi to make. Nori seaweed wrap is quite expensive especially in the Philippines. wow that looks really amazing and so tasty. Where can we get one of those?